In previous studies, oxidative stress damage has been solely considered to be the mechanism of ovarian aging, and several antioxidants have been used to delay ovarian aging. But recently, more reports have found that endoplasmic reticulum stress, autophagy, sirtuins, mitochondrial dysfunction, telomeres, gene mutation, premature ovarian failure, and polycystic ovary syndrome are all closely related to ovarian aging, and these factors all interact with oxidative stress. These novel insights on ovarian aging are summarized in this review. Furthermore, as a pleiotropic molecule, melatonin is an important antioxidant and used as drugs for several diseases treatment. Melatonin regulates not only oxidative stress, but also the various molecules, and normal and pathological processes interact with ovarian functions and aging. Hence, the mechanism of ovarian aging and the extensive role of melatonin in the ovarian aging process are described herein. 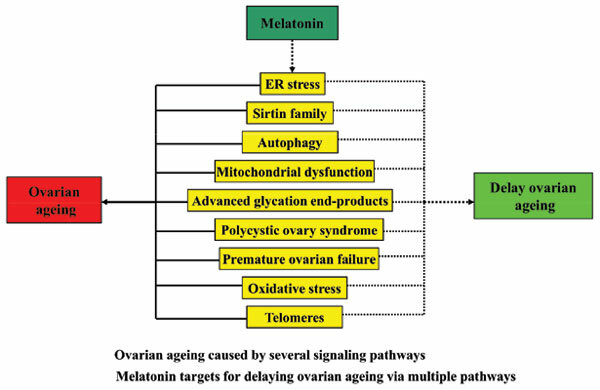 This systematic review supply new insights into ovarian aging and the use of melatonin to delay its onset, further supply a novel drug of melatonin for ovarian aging treatment. Melatonin, oxidative stress, endoplasmic reticulum stress, autophagy, ovarian aging.